Perhaps, for the Youngbloods in the audience, I should explain. Older telephone numbers were patterned after words — presumably easier to remember — in the same way some business numbers are (whimsically) 1-800-BUY JUNK. My childhood phone number began with “PE” for Pershing, the general; now it would simply be 7 3. All clear? I love Eddie Condon’s music and everything relating to it. I wan’t of an age to visit West Third Street, nor the club on Fifty-Sixth, although I spent some delightful evenings at the posthumous version on Fifty-Fourth (one night in 1975 Ruby Braff was the guest star and Helen Humes, Joe Bushkin, Milt Hinton, Jo Jones, Brooks Kerr and a few others sat in). I didn’t buy it — so you might still be able to — but I did have fleeting thoughts of taking it to a print shop and ordering a few hundred replicas, more gratifying than the glossy cards with pictures of Tuscany on them. I did buy something, though — irresistible to me — that struck a far more receptive chord. Whether I will use it or frame it has not yet been decided. I’ll know when it arrives. If you have no idea what this is, ask Great-Grandma, who used such a thing to stir her whiskey sour. The global attic / museum / antique shop known as eBay never fails to surprise. 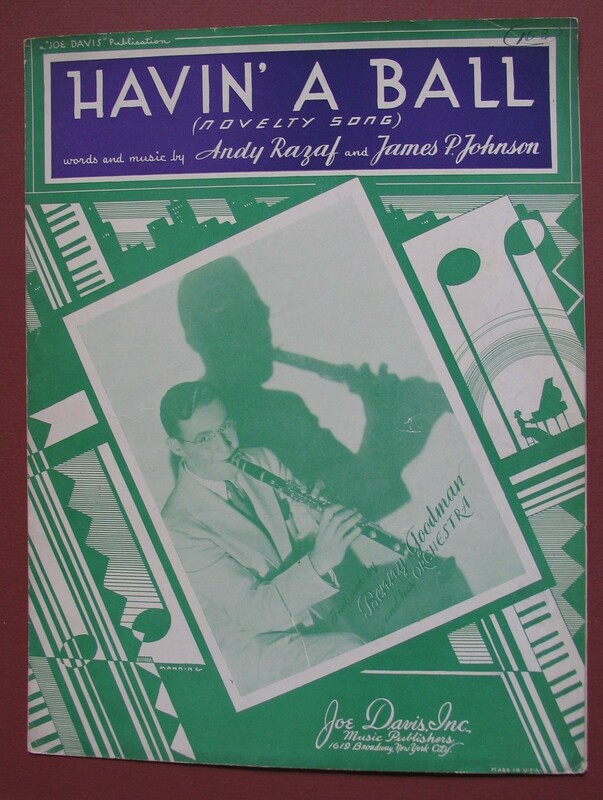 Here’s something recently posted — the sheet music for a James P. Johnson / Andy Razaf song, HAVIN’ A BALL. I don’t think it enjoyed wide currency, and I suspect it was another version of SPREADIN’ RHYTHM AROUND and THE JOINT IS JUMPIN’ — that is, once the music is hot, everyone is happy. Valid enough. James P. recorded it for Columbia in 1939 — under the aegis of John Hammond — with a band including Henry “Red” Allen, Gene Sedric, J. C. Higginbotham, and Sidney Catlett — but the sides weren’t issued at the time and they only emerged on a 1962 compilation of James P.’s Columbia recordings. Sometimes the business of music is as intriguing as the music itself. Too much has been made of Goodman as Caucasian exploiter, and in 1937 he hardly needed to extort money from James P., Razaf, or Joe Davis to have his picture on the cover — a sure guarantee of increased sales. And he isn’t a “co-composer” here, which suggests that the Goodman band actually played this song. Goodman expert/ discographer David Jessup says that no broadcast performances of it exist to his knowledge. Of course, the band might have played it at a dance that wasn’t documented or for a broadcast that wasn’t notated by Bob Inman or captured by an enthusiast with a disc recorder. But I wonder how this partnership came to be. Did one of the composers or publisher Davis “reach out” (as they used to say on television police shows) to a Goodman arranger and work out a mutually advantageous arrangement: a good tune for a swing band, let’s get it some airplay? Youth wants to know. Alas, I can’t provide an audio track. You’ll have to find a copy of the Columbia lp FATHER OF THE STRIDE PIANO or the Classics CD on which it appears: I recall a Meritt Record Society vinyl issue had several alternate takes. In its heyday, the tune was recorded by Fats Waller, Billy Kyle, George Zack, Max Kaminsky . . . and there is presumably a 1958 Goodman version, which suggests that an actual arrangement was created. But when? The only contemporary version I know is found on the Arbors CD by the International Hot Jazz Quartet — Duke Heitger, Engelbert Wroebel, Paolo Alderighi, Oliver Mewes. This is the most fascinating (and witty) bill I’ve ever seen, and I would have gladly paid it. 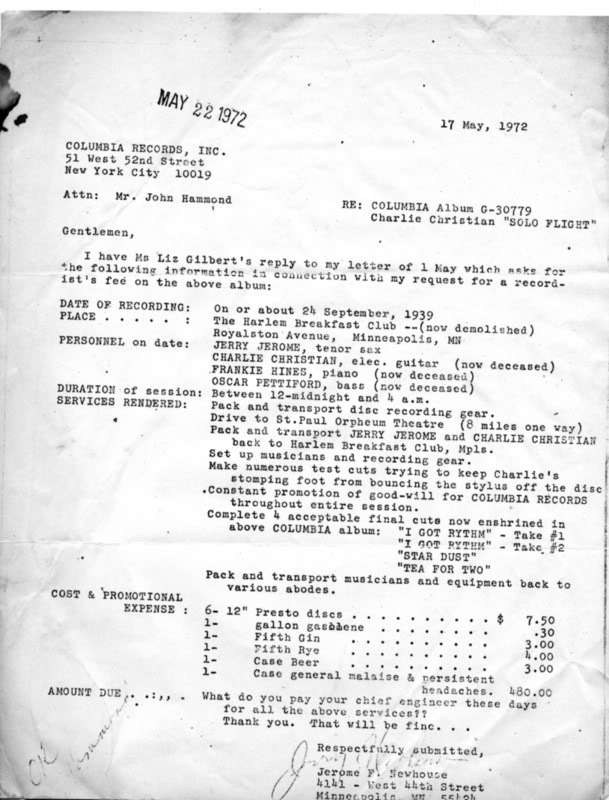 The letter below will not be new to Charlie Christian devotees, but I recently learned about it from Peter Jung. Its owner Chris Albertson (jazz scholar, record producer, and blogger) very graciously encouraged me to repost it here. In the late Thirties, Jerome F. “Jerry” Newhouse of Minneapolis was a devout swing fan. This profile in itself would not be unusual, but Jerry did more than sourrounding himself with Benny Goodman Victors and Columbias. He bought a professional disc-cutting machine and began recording Goodman and other bands off the radio: And he took his disc cutter with him to the Harlem Breakfast Club for an after-hours session with two players from the Goodman band and two local players. Although the session had not been issued commercially, it was known among Charlie’s admirers — who understandably treasured every note their laconic, short-lived hero had played. I don’t know how Newhouse and John Hammond came to know each other, but when Hammond was producing a new two-lp Charlie Christian collection, the session that Newhouse had recorded in 1939 emerged as exciting material for reissue. 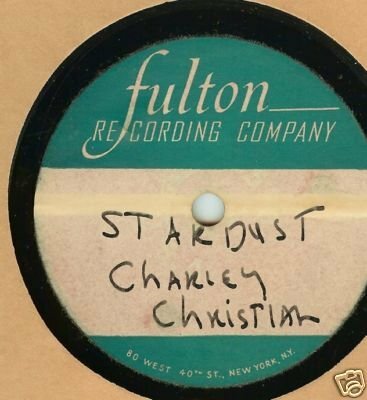 It was a remarkable session — one of Charlie’s earliest live appearances on record, an unusual opportunity for him to be recorded after hours (Jerry Newman’s Harlem sessions were still two years in the future), and it found Christian among excellent players. Pianist (presumably a local Minneapolis player) Frankie Hines lacks some of the flash of his almost-namesake, but his ump-cha is all that is needed to accompany the soloists, and he plays credible solos. Tenor saxophonist Jerry Jerome was one of the hot soloists of the 1939 Goodman band, merging Lester and Ben in his own fashion, and I suspect he did not get space to stretch out on solos within that orchestra. Jerome continued to have a rolling fluid approach to his instrument for many decades. 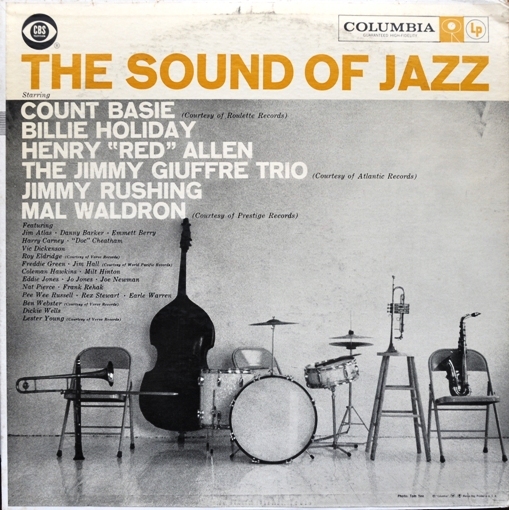 Bassist Oscar Pettiford was still a minor in the eyes of the law, and although his playing is not assertive in the fashion of his great Forties and Fifties playing, this is his earliest appearance on disc. Charlie Christian lived for the hours he could spend on the bandstand without facing arrangements on manuscript paper: although someone on YouTube has commented that Charlie is “overrated,” that is only because his graceful, pulsing work has been so absorbed into the collective unconscious of all jazz guitarists that it takes a small leap backwards to understand just how striking his work was. The letter is a hilarious recounting (masquerading as a bill) of what the session must have been like. Close your eyes and imagine — in appropriate black-and-white — Newhouse waiting until the Goodman band had finished to bundle Jerome and Christian into his car, guitar, heavy amplifier, tenor sax included. Imagine the delight of the patrons of the Harlem Breakfast Club when the jazz stars showed up; invent some small dialogue between Hines, Pettiford, Jerome, and Christian. I don’t know (in my imagined screenplay) where the two bottles of liquor and the ccome in, but they were invaluable. Don’t leave out the dialogue — polite for sure — of Newhouse trying to get Charlie to stop stomping his foot so energetically. “General malaise and headaches” will have to be imagined individually by each reader. And gasoline at thirty cents a gallon . . . .
Who cares that Newhouse couldn’t spell RHYTHM? This piece of paper takes us behind the scenes . . .and is thus priceless, especially since none of the participants are living to tell their version of the story. And the thing in itself, a disc from Jerry Jerome’s collection: not Newhouse’s original Presto, but what I assume is a contemporaneous copy. Thank you, musicians, Jerry Newhouse, Columbia Records, and the enterprising (and generous) Chris Albertson.